As an older guy who used to be a knife dealer, the two Leatherman models reviewed fit a niche. I want to give practical gifts to the younger relatives, many of whom have not camped/walked in the woods/accumulated a lifetime of tools, but who have a car. I also wanted trading goods. So, I purchase used, refurbish and give them away. You can put one in the travel suitcase, the Go To Bag, the office desk, the windbreaker, the walking shorts and if you lose it, no great pain. The old rule is that if a tool is too bulky, too expensive or too heavy, you aren’t going to have it with you in a minor emergency. Of course, “the Wave” outperforms both. However, you can obtain multiples of those two models for the price of a Wave. My pleasure as always. Thank you for reading. I did not mention the “gift” nature of the Squirt, as for review purposes I think it’s a little of an easy out to simply suggest a given tool is a good idea for a gift (rather than examine it purely on the merits), but I totally agree that this makes a great gift. The price is right, it has universal appeal to regular people and EDC enthusiasts, and it’s a great size. I think most people would appreciate something like the Squirt. This review is really dialed in. The Squirt is surprisingly well made and this combines with its cute, compact looks to give it an outsized personality. It is a strong contender in the “B tool” category — dropped in an offside pocket as a companion to a full sized, clipped folding knife on the strong side. The pliers are definitely the standout tool. They are convenient to use, nimble and punch well above their weight. 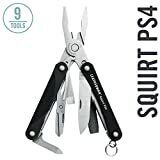 If you use EDC pliers a lot it is going to be hard to beat the Squirt PS4 as your B tool. (I don’t find much use for the tiny PS4 scissors. If you want a scissors-centric B tool, I’d go with the Leatherman Style CS all day. Those are stout, agile and as good as the pliers are here. It’s fitting that the Victorinox Alox Cadet keeps popping up in the size comparison photos, because man, the Cadet just haunts this entire category, you can’t escape it. I EDc’d a Squirt for several months and loved it before I discovered the joys of the Cadet … now I rarely carry the Squirt and feel a twinge of guilt when I see the little Leatherman folded neatly in my gear chest. I don’t use pliers much day to day and the Cadet’s SO strong as a PC backup knife, an exemplary cap lifter, great drivers and it’s slim and…. Basically there are times when the Cadet’s superlative utility becomes almost oppressive, wiping out tons of lovable alternatives from my B tool rotation. I rarely carry my nice little Case traditionals anymore for the same reason. Darn it, I’m gonna carry the Squirt today. B Tool Liberation! Thank you for the very kind words. The Cadet still strikes me as a the gold standard in micro multi-tools. Of course if you need something with pliers you are out of luck with a Cadet, but if you need to use pliers a lot you can probably get away with a full size multi-tool on a belt sheath. Also, most people have a Cadet so at it makes for a good size comparison. Still, there is something so satisfying about the Squirt. It’s built phenomenally well. I’m glad I have one. It is a great gift (esp to a college kid if blue or red are school colors) and as you pointed out, what make it so are the build quality and ingenious design. Has “wow” factor for non enthusiasts once they see all that this tiny thing can do. Cheers! What do you see as being mor functional, the micra or the squirt? Probably the Squirt because you can access the tools without opening up the handle, but I think it depends on whether you have a greater use for scissors or mini pliers. I am guessing most people will have a greater use for the mini pliers, but that’s a “Your Mileage May Vary” kind of thing. I’ve been EDCing a PS4 for a couple of years now, and while I don’t need it every day, the pliers do regularly come in handy. The scissors are the weak link here. Mine broke after only occasional use. Leatherman honored the warranty and replaced it for free when I sent it in, but the replacement scissors soon broke also. Aside from the scissors, it is a really nice tool. Thanks for taking the time out to comment. It’s nice to hear from someone who has used the PS4 for an extended period of time. I’ve only had mine for a couple months, so it’s great to get your perspective. I agree that the Scissors and the little bottle opener seem like the weakest links on this tool. Glad Leatherman stands by their warranty. They seem like a stand up company. I am glad to hear the reputation is well deserved. I love this tool! I have carried one in my wallet for many years and had countless of uses. I have frequent visits to government institutions including court, which makes carrying other larger tools very inconvenient. I sharpened the end of the file on mine and converted it into a chisel. Your review is accurate. ML, Thanks for checking out the review! Glad you are enjoying your PS4 as well. Carry yours in good health! Hi Dan, Excellent review! TSA Nashville is now the proud owner, of my 3 month old Squirt PS4. Sigh. But it is a great tool I will buy again. Only complaint is that they should have designed the bottle opener a smidge deeper. Damn! Another tool claimed by TSA… hate it when that happens. Glad you have been enjoying your PS4. This little tool continues to surprise me with its versatility. I agree, a deeper bottle opener would not be a bad thing. — TERRIFIC YEARS of Every Day Carry & Use ! !